Even if you’ve invested in your own private jet, long haul destinations can sometimes mean flying commercial is unavoidable. However, with the quality of first class seats growing ever more luxurious this can still be an enjoyable experience. Click through for our guide to the best first class seats around. British Airways British Airways is renowned for representing the best of British and its First Class Suite doesn’t disappoint. Each stylish suite is equipped with a 15-inch screen, noise cancelling headphones and power supplies for personal devices. If you are looking to get some rest then you can slip into your pair of cotton pyjamas while the crew transform your seat into a 198cm fully flat bed with a quilted mattress, white cotton duvet and pillow. To ensure that you arrive at your destination feeling fully refreshed you can make the most of a Liberty London amenity kit featuring selected aromatherapy essentials. There are also plenty of refreshment opportunities while on board with one of the widest ranges of award winning champagnes and wines on offer. British Airways has worked with a team of top chefs to create its “Height cuisine” which has been designed to offer the fullest flavours while at altitude. In keeping with the British theme a traditional afternoon tea is also served with a selection of individual sandwiches, pâtisserie and scones. A first class seat from London to New York JFK with British airways starts from £8,960. Even if you’ve invested in your own private jet, long haul destinations can sometimes mean flying commercial is unavoidable. However, with the quality of first class seats growing ever more luxurious this can still be an enjoyable experience. Click through for our guide to the best first class seats around. British Airways is renowned for representing the best of British and its First Class Suite doesn’t disappoint. Each stylish suite is equipped with a 15-inch screen, noise cancelling headphones and power supplies for personal devices. If you are looking to get some rest then you can slip into your pair of cotton pyjamas while the crew transform your seat into a 198cm fully flat bed with a quilted mattress, white cotton duvet and pillow. To ensure that you arrive at your destination feeling fully refreshed you can make the most of a Liberty London amenity kit featuring selected aromatherapy essentials. There are also plenty of refreshment opportunities while on board with one of the widest ranges of award winning champagnes and wines on offer. British Airways has worked with a team of top chefs to create its “Height cuisine” which has been designed to offer the fullest flavours while at altitude. In keeping with the British theme a traditional afternoon tea is also served with a selection of individual sandwiches, pâtisserie and scones. A first class seat from London to New York JFK with British airways starts from £8,960. Taking second place in the 2016 Skytrax World Airline Awards, Cathay Pacific has long been seen as an innovator in the high-class airline market. As well as the usual perks of fast track check-in and first class lounges, of which there are no fewer than five at Cathay’s ‘home’ airport Hong Kong, once on board you will be just one of six privileged first class passengers ensuring the absolute in personalised service. Of course, the second benefit of this is that Cathay boasts the widest seats in the air, each of which is equipped with a touchscreen control pad, 500 thread count duvets and pillows and turn down service. Much of the on-board menu has been created in partnership with the world’s top hotels and chefs and is available any time while 17-inch screens and Bose noise-cancelling headphones will keep you entertained in between meals. To top it all off the sleek amenity kit comes courtesy of Aesop while pyjamas are made by Hong Kong-based brand PYE using 100% organic cotton. 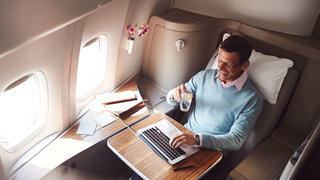 A first class seat from London to Hong Kong with Cathay Pacific begins from £4,353. Taking second place in the 2016 Skytrax World Airline Awards, Cathay Pacific has long been seen as an innovator in the high-class airline market. As well as the usual perks of fast track check-in and first class lounges, of which there are no fewer than five at Cathay’s ‘home’ airport Hong Kong, once on board you will be just one of six privileged first class passengers ensuring the absolute in personalised service. 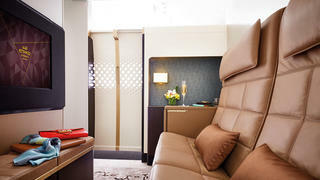 Of course, the second benefit of this is that Cathay boasts the widest seats in the air, each of which is equipped with a touchscreen control pad, 500 thread count duvets and pillows and turn down service. Much of the on-board menu has been created in partnership with the world’s top hotels and chefs and is available any time while 17-inch screens and Bose noise-cancelling headphones will keep you entertained in between meals. To top it all off the sleek amenity kit comes courtesy of Aesop while pyjamas are made by Hong Kong-based brand PYE using 100% organic cotton. A first class seat from London to Hong Kong with Cathay Pacific begins from £4,353. The closest you'll get to a private jet experience on a commercial airline, Etihad's The Residence offering takes the notion of first class to a whole new level. After being chauffeured to the airport in a luxury car, passengers are greeted with a private check-in and lounge while every detail is taken care of by Etihad's VIP travel concierge. Upon boarding the plane, guests will find not just a private room but their very own three room suite with bedroom, lounge and bathroom. Designed for two people, the lounge features a double leather sofa and 32 inch television while the bedroom boasts a six foot double bed and a further 27 inch television as well as an ensuite bathroom with full-height shower, luxury amenities and bathrobes. All needs are catered to throughout the flight by a Savoy-trained dedicated butler on hand to deliver drinks and meals prepared on request by Etihad's highly-skilled inflight chef. The airline also offers VIP passengers a lifestyle concierge service able to book event tickets, make restaurant reservations and much more in your chosen destination. A return flight on board The Residence between London and Abu Dhabi starts from £10,950 for one person or £16,530 for two people. The closest you'll get to a private jet experience on a commercial airline, Etihad's The Residence offering takes the notion of first class to a whole new level. After being chauffeured to the airport in a luxury car, passengers are greeted with a private check-in and lounge while every detail is taken care of by Etihad's VIP travel concierge. Upon boarding the plane, guests will find not just a private room but their very own three room suite with bedroom, lounge and bathroom. Designed for two people, the lounge features a double leather sofa and 32 inch television while the bedroom boasts a six foot double bed and a further 27 inch television as well as an ensuite bathroom with full-height shower, luxury amenities and bathrobes. All needs are catered to throughout the flight by a Savoy-trained dedicated butler on hand to deliver drinks and meals prepared on request by Etihad's highly-skilled inflight chef. The airline also offers VIP passengers a lifestyle concierge service able to book event tickets, make restaurant reservations and much more in your chosen destination. A return flight on board The Residence between London and Abu Dhabi starts from £10,950 for one person or £16,530 for two people. Part of the new breed of airline offering an experience above first class, Singapore Airlines recently began offering a double bed as part of its new private suites. Sliding doors and window blinds give you complete privacy and each Jean-Jacques Coste designed cabin contains both a standalone bed and separate leather armchair with partners travelling together able to combine suites to create a double bed. A chaise longue and large table can also transform your suite into a dining or relaxing area. Meals are served on Wedgwood china with menus created by a panel of eight top chefs from around the world. 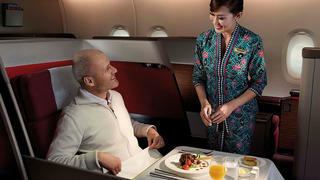 Passengers can book their meals 24 hours in advance and all are available with paired wines. Each suite is also equipped with a 23-inch widescreen entertainment centre, Internet connectivity, Givenchy pyjamas and a Salvatore Ferragamo amenity kit. Of course, passengers are also privy to the usual ground services including a porter, private immigration entrance, check-in reception and first class lounges with showers, bar, buffet, meeting rooms and Wi-Fi. A suite from London to Singapore with Singapore Airlines begins from £4,232. Part of the new breed of airline offering an experience above first class, Singapore Airlines recently began offering a double bed as part of its new private suites. Sliding doors and window blinds give you complete privacy and each Jean-Jacques Coste designed cabin contains both a standalone bed and separate leather armchair with partners travelling together able to combine suites to create a double bed. A chaise longue and large table can also transform your suite into a dining or relaxing area. Meals are served on Wedgwood china with menus created by a panel of eight top chefs from around the world. Passengers can book their meals 24 hours in advance and all are available with paired wines. Each suite is also equipped with a 23-inch widescreen entertainment centre, Internet connectivity, Givenchy pyjamas and a Salvatore Ferragamo amenity kit. Of course, passengers are also privy to the usual ground services including a porter, private immigration entrance, check-in reception and first class lounges with showers, bar, buffet, meeting rooms and Wi-Fi. 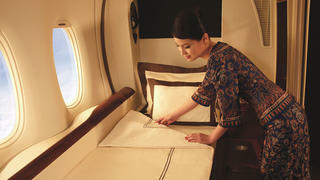 A suite from London to Singapore with Singapore Airlines begins from £4,232. It can’t be denied that Malaysian Airlines has had something of a rough time over the past few years but the upshot of this is that in a bid to attract custom the airline has upped its levels of comfort and service on a par with some of the world's biggest airlines earning it a Skytrax five-star rating. Passengers flying first class now enjoy 50kg of luggage plus two carry-on bags, fast track check-in and security and access to the sumptuous Golden Lounges worldwide. Once in the air, overnight passengers receive pyjamas, slippers and a luxury amenity kit, a la carte fine dining and wine pairings available at any time, 23-inch wide screen entertainment systems, personal closet and wide lie-flat seats with ottomans. Configured in a 1-2-1 pattern, each seat has aisle access while the middle seats can be partitioned for privacy or left open for couples travelling together. A first class seat from London to Kuala Lumpur with Malaysian Airlines begins from £4,385. It can’t be denied that Malaysian Airlines has had something of a rough time over the past few years but the upshot of this is that in a bid to attract custom the airline has upped its levels of comfort and service on a par with some of the world's biggest airlines earning it a Skytrax five-star rating. Passengers flying first class now enjoy 50kg of luggage plus two carry-on bags, fast track check-in and security and access to the sumptuous Golden Lounges worldwide. 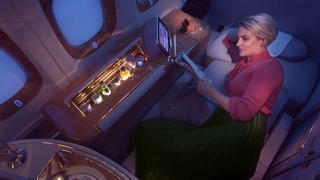 Once in the air, overnight passengers receive pyjamas, slippers and a luxury amenity kit, a la carte fine dining and wine pairings available at any time, 23-inch wide screen entertainment systems, personal closet and wide lie-flat seats with ottomans. Configured in a 1-2-1 pattern, each seat has aisle access while the middle seats can be partitioned for privacy or left open for couples travelling together. A first class seat from London to Kuala Lumpur with Malaysian Airlines begins from £4,385. Renowned as one of the most luxurious airlines in the world, Emirates treats its first class passengers with the most decadent of service. Start your journey in style with Emirates’ complimentary chauffeur service before a quick check-in, and then freshen up with a shower, drink or dinner in the Emirates lounge. On board enjoy Bvlgari amenities and skincare products from Voya, receive pyjamas specially formulated to help keep skin hydrated and settle in to private suite — complete with vanity table, mirror, mini bar, ambient lighting and lie-flat beds — before ordering a regionally inspired dish served on Royal Doulton china with Robert Welch cutlery. Rejuvenate in the on-board Shower Spa before landing or take some time to chat with fellow passengers in the on-board first and business class lounge which serves cocktails, Champagne, beers and wine. A first class seat from London to Dubai with Emirates begins from £3,324. Renowned as one of the most luxurious airlines in the world, Emirates treats its first class passengers with the most decadent of service. Start your journey in style with Emirates’ complimentary chauffeur service before a quick check-in, and then freshen up with a shower, drink or dinner in the Emirates lounge. On board enjoy Bvlgari amenities and skincare products from Voya, receive pyjamas specially formulated to help keep skin hydrated and settle in to private suite — complete with vanity table, mirror, mini bar, ambient lighting and lie-flat beds — before ordering a regionally inspired dish served on Royal Doulton china with Robert Welch cutlery. Rejuvenate in the on-board Shower Spa before landing or take some time to chat with fellow passengers in the on-board first and business class lounge which serves cocktails, Champagne, beers and wine. A first class seat from London to Dubai with Emirates begins from £3,324. Instead of offering separate business and first classes, Virgin Atlantic offers one upper class which boasts all the luxuries of a traditional first class experience. After being picked up from your home by a chauffeur, passengers can expect a personalised check-in service and, if flying from Heathrow, can take advantage of Virgin Atlantic’s private security channel and upper class wing. Leave time to check out the award-winning Clubhouses found worldwide, some of which are equipped with spas offering haircuts and manicures, as well as showers, video games, bar and a la carte dining. Thanks to an unusual inward-facing layout, each upper class suite offers aisle access as well as a wide seat that turns into a 33” wide 6’6” long bed. There’s also an ottoman seat for travel companions, power sockets, Wi-Fi, sleep suits and live news feeds. Dining has been specially designed to suit passenger body clocks with special menus prepared for food round-the-clock all served on fine china. An upper class seat from London to New York with Virgin Atlantic begins from £5,590. Instead of offering separate business and first classes, Virgin Atlantic offers one upper class which boasts all the luxuries of a traditional first class experience. After being picked up from your home by a chauffeur, passengers can expect a personalised check-in service and, if flying from Heathrow, can take advantage of Virgin Atlantic’s private security channel and upper class wing. Leave time to check out the award-winning Clubhouses found worldwide, some of which are equipped with spas offering haircuts and manicures, as well as showers, video games, bar and a la carte dining. Thanks to an unusual inward-facing layout, each upper class suite offers aisle access as well as a wide seat that turns into a 33” wide 6’6” long bed. 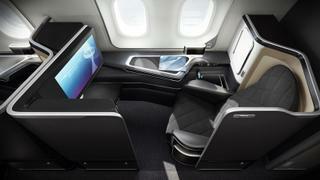 There’s also an ottoman seat for travel companions, power sockets, Wi-Fi, sleep suits and live news feeds. Dining has been specially designed to suit passenger body clocks with special menus prepared for food round-the-clock all served on fine china. An upper class seat from London to New York with Virgin Atlantic begins from £5,590.